Denver, we have a problem. Your ski train may be grinched right out from under your Christmas tree. Amtrak has been in negotiations since early this month with Iowa Pacific Holdings on providing crews on the Rio Grande Scenic Ski Train, IPH's planned restoration of service between Denver and its premiere ski area, Winter Park. The Ski Train ran without major disruption for 69 years, carrying eager skiers by rail to hit the slopes for the day, returning them to Denver's Union Station in the evening.  Skiers could ride for a reasonable price, purchase their lift tickets on board the train, and avoid the serpentine roads, treacherous curves and traffic congestion on Berthoud Pass. 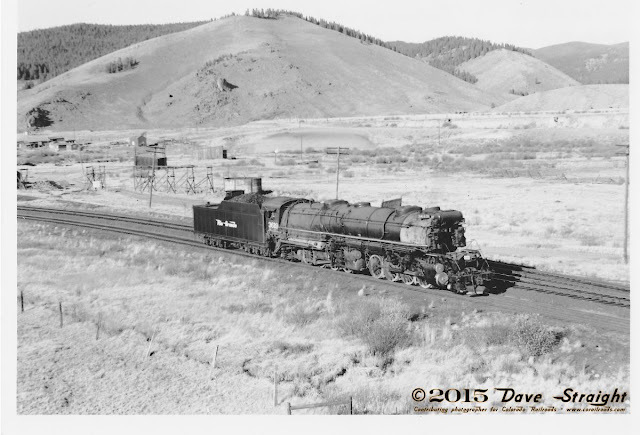 From 1940 to 1988, 48 years, the Denver and Rio Grande Western Railroad ran the train until Phillip Anschutz's Ansco purchased the Ski Train and operated it for another 20 years. Then, earlier this year, Ansco sold the train equipment and terminated the service, seemingly without any warning, citing operating losses. Since then, Ed Ellis and Iowa Pacific, the parent company of the Rio Grande Scenic Railroad in the San Luis Valley, have worked to restore the service. Ellis got Union Pacific--corporate successor to the Denver and Rio Grande Western--to let his equipment run on their rails between Denver and Tabernash, but UP stipulated that Amtrak must crew the trains.1 Ellis has been in negotiations with Amtrak since then. 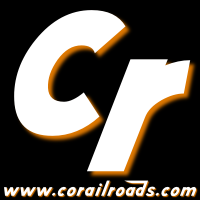 We were fully prepared for the season based on the terms of a contract we negotiated in October 2009 with Amtrak. Unfortunately, Amtrak now wants to re-negotiate, and the new terms are both impractical and unreasonable. Amtrak also claims in court documents that IPH said the charter train contracts were for one-time or otherwise limited charters, not a regular service like the Ski Train. 2 This is frankly unbelievable because of IPH's publicly stated intentions to be the successor to Ansco's service. 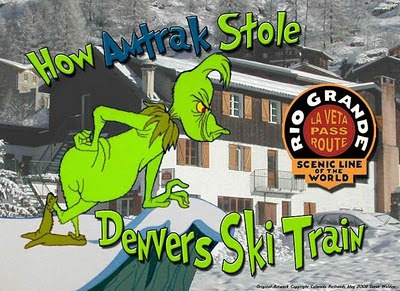 Is Amtrak trying to kill the Ski Train and grinch Denver days before it's return? With a few minor adjustments, Amtrak could add a stop at the Winter Park ski area and run it's own version of the Ski Train, much like the Grinch tried to replace Santa Claus with his own creation. Denver could find itself bypassed with a uniquely Denver tradition co-opted and franchised across America with AmSki service. Such an "innovation" would not be possible if the Ski Train still existed. Although it is only one of several possible explanations, the motive is certainly there. Someone needs to step in and re-rail this process while the chance of saving the Ski Train is still real. Who knows? Maybe UP will drop their Amtrak requirement and allow IPH to work something else out. Whatever they do, it must happen quickly.